This study was done to gain an understanding of the cellular anatomy of the retina, as well as attempting to visualize the retinal architecture in a 3D forest-like environment. Challenges included perspective, depth, as well as going against traditional depictions of the retina. Mediums used were graphite, pen and ink, and ink wash. This study depicts the temporal progression of retinitis pigmentosa and to learn the science needed for the final piece. Mediums used were graphite, pen and ink, ink wash, and Adobe illustrator. Using the tissue landscape and tissue cube studies, a layout sketch was completed using photoshop and traditional media. Text and other elements were then added. 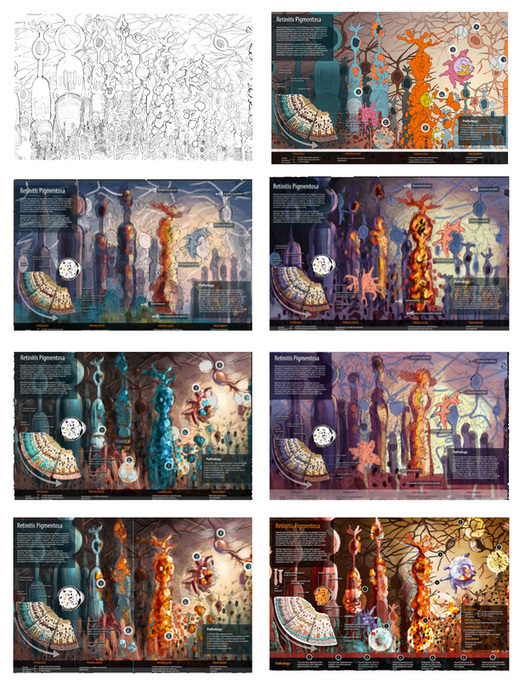 A series of color studies were done in Adobe Photoshop. Choosing a color palette was one of the most difficult steps of this piece. It was a challenge to find different colors for each cell type while maintaing an aesthetic, cohesive image. Most of my attempts had too many colors and resulted in visual noise and clutter. After the comprehensive sketch and color palette were approved, the production process began. Each element was first pathed in Adobe Illustrator and then rendered in Adobe Photoshop. Berson EL. Retinitis pigmentosa. The Friedenwald Lecture. Invest Ophthalmol Vis Sci.1993;34(5):1659–1676. David, Paton, Barry N. Hyman, Johnny Justice, and Baird A. Thomas.Introduction to Opthalmoscopy: A Scope Publication. Kalamazoo: UpJohn, 1976. Print. FRIEDENWALD JS, CHAN E. PATHOGENESIS OF RETINITIS PIGMENTOSA: WITH A NOTE ON THE PHAGOCYTIC ACTIVITY OF MÜLLER'S FIBERS. Arch Ophthalmol. 1932;8(2):173-181. Hartong, Dyonne T., Eliot L. Berson, and Thaddeus P. Dryja. "Retinitis Pigmentosa. "The Lancet 368.9549 (2006): 1795-809. Web. Krstić, Radivoj V. Human Microscopic Anatomy: An Atlas for Students of Medicine and Biology. Berlin: Springer-Verlag, 1991. Print. Milam , A.H. , Li , Z-Y. & Fariss , R.N. ( 1998 ). Histopathology of the human retina in retinitis pigmentosa . Progress in Retinal and Eye Research 17 , 175 – 205 . Perkins, Edward S., Peter Hansell, and Ronald J. Marsh. An Atlas of Diseases of the Eye. Edinburgh ; New York: Churchill Livingstone, 1986. Print. Portera-Cailliau, C. "Apoptotic Photoreceptor Cell Death in Mouse Models of Retinitis Pigmentosa." Proceedings of the National Academy of Sciences 91.3 (1994): 974-78. Web. Santos, A., M. S. Humayun, E. De Juan, R. J. Greenburg, M. J. Marsh, I. B. Klock, and A. H. Milam. "Preservation of the Inner Retina in Retinitis Pigmentosa: A Morphometric Analysis." Archives of Ophthalmology115.4 (1997): 511-15. Web.